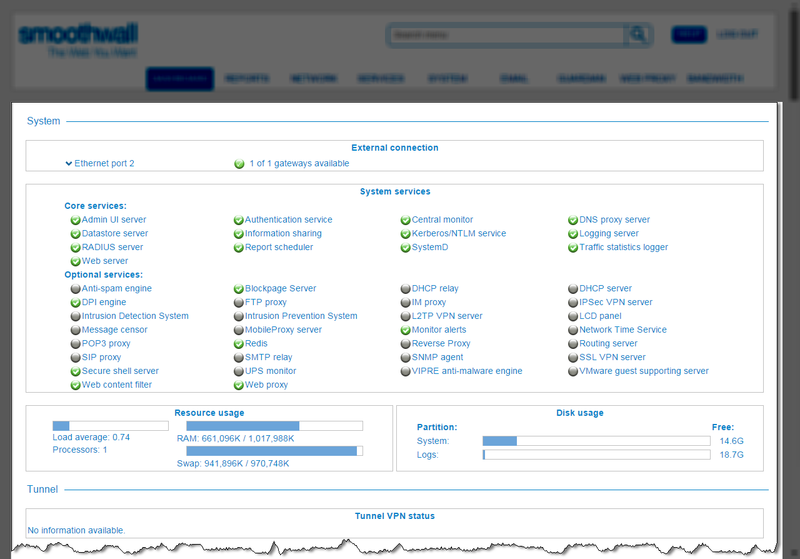 The Dashboard is the default home page of your Smoothwall system, providing a summary of the current state of the Smoothwall. • System services — Displays the status of Core and Optional services. If available, you can click on the service name to jump to the relevant configuration page. • Resource usage — Displays status of various aspects of your hardware appliance. • Recent alerts — Displays important alerts from the Smoothwall, such as, memory usage, and system reboots.  Tunnel — Displays the status of any VPNs configured on the system. Note: You may not see this option if you are not licensed for Unified Threat Management. For more information, contact your Smoothwall representative. • Recent blocks — Lists recently blocked web requests. • Top domains (hits, 24 hours) — Lists the most frequently visited domains in the last 24 hours. • Top domains (24 hours) — Lists the most frequently requested domains in the last 24 hours. • Top viruses — Lists the most frequently detected viruses on the system. • Proxy statistics — Provides a statistical summary for the web proxy. Note: You may not see this option if you are not licensed for Guardian. For more information, contact your Smoothwall representative. You can choose to hide any of the above sections from your Dashboard. For a detailed description of how to do this, see Customizing the Administration User Interface. To customize the controls displayed in the Dashboard, see Control page template.